The Department of Pure and Applied Botany (PAB), College of Biosciences (COLBIOS), has held its first Field Day workshop tagged, “Growing Greens: Essential for Healthy Living”, to sensitise members of the University community and the general public on the importance, uses and health benefits of some common plants; showcased plants that could contribute to improving daily healthy living; stimulate students’ interest in the field of botany and; prepare students for life-after-school in the field of Botany. Commending the initiative of the Department, the Vice-Chancellor, Professor Olusola Oyewole, who was represented by the Deputy Vice-Chancellor, Development, Professor Ololade Enikuomehin, expressed satisfaction with the amount of work that had been put into improving the garden. According to him, this was a confirmation that the students in the Department would not only go through theoretical training, but would be taken through practicals in their field of study. Professor Enikuomehin, who noted that the field of Botany was a lucrative and viable one, disclosed further that he was also a Botanist and charged the students to be rest assured that a great future lies ahead for them in the field of Botany. Speaking on the efficacy of some common plants, the guest lecturer, Dr. Idayat Gbadamosi, a practising Ethno-botanist from the Department of Botany, University of Ibadan, spoke extensively on the theme of the field day. She enumerated the prevalence of diseases in Nigeria and the roles of herbal products in the treatment of such diseases, stating that the secondary metabolites, plant nutrients and plant minerals found in plants have medicinal effects, which are important in addressing health issues. Dr. Gbadamosi reeled out recipes for some diseases and ailments using plants, which she said had been proven over time to work well, while encouraging participants to ensure they use both Vernonia amygdalina (bitter leaf) and Ocimum gratissimum (efirin). “These are plants very close to us and with good medicinal contents”, as she concluded that the growing and sustainable use of ‘greens’ would ensure their availability as food, medicine and ornamentals. In her goodwill message, the Deputy Vice-Chancellor, Academic, Professor Catherine Eromosele, lauded the vision of the Botanical Garden Park and prayed that the Department continues to wax stronger. Earlier in his Address, the Dean, COLBIOS, Professor David Agboola commended the quality of staff that make up the Department, attributing the success of the Department to the tenacity and dedication of the entire workforce. He also appreciated the University Management for its support and requested that the Vice-Chancellor approves an increase in the number of hectares of land allocated to the botanical garden. The Deputy Vice Chancellor (Academic), Professor Catherine Eromosele and other dignitaries, thereafter, took turns in planting ornamentals on the proposed site of the park. There was also an interdepartmental debate between students in the Departments of Microbiology, Biochemistry and Pure and Applied Botany on the topic, ‘Botanicals vs Synthetic Drugs (pills) for healthy living’. In another development, members of the FUNAAB Community Organic Box Scheme (COBS), Organic Project in Tertiary Institutions in Nigeria (OAPTIN), recently had their Open Day with a clarion call on members of the University community to join the scheme, as part of the measures to promote healthy living. Speaking on the Organic Agriculture Skills Demonstration Plot, Dr. Tunrayo Joseph-Adekunle, said organic agriculture is the type of farming without the use and application of an agro-fertilizer. According to her, membership of the scheme, which currently stands at 27, is voluntary and open to members of the FUNAAB community (academic and non-teaching), who are desirous of promoting healthy living, increase their life span and have a peaceful rest of mind in whatever they consume. 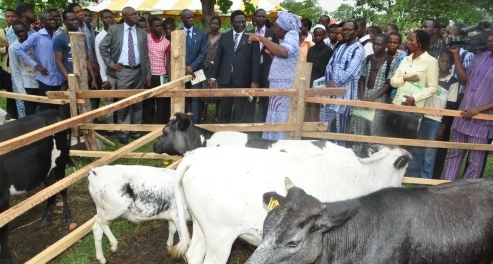 At the occasion, Dr. Joseph-Adekunle, who represented the coordinator of the scheme, Professor Jonathan Atungwu, said COBS was based on integrity, as this was the main reason why organic products were often been shared equally among members, every Friday of the week, throughout year round and in a sustainable manner. The scheme produces organic vegetables, pineapple, moringa, plantain, egg plants, passion fruits, fluted pumpkin, cucumber, pepper, tomato, sweet potato, pawpaw, oranges and maize, among others. She listed some of the challenges being faced on the farm to include stealing of produce by unknown persons, shortage of water and insect-pests attack. Responding, members of the scheme appreciated the efforts of the technical team promising to always cooperate and support the cause of organic agriculture. They also called on the University Management to assist the scheme by digging a functional well that would provide regular water for the plants. COBS has further reiterated its determination to ensure all-year-round supply of fresh, high quality and healthier organic produce to its members and the entire University community. Interested persons, who intend to join the scheme, should contact the coordinator through: oaptincommunitybox@gmail.com, or call: 08037156261.